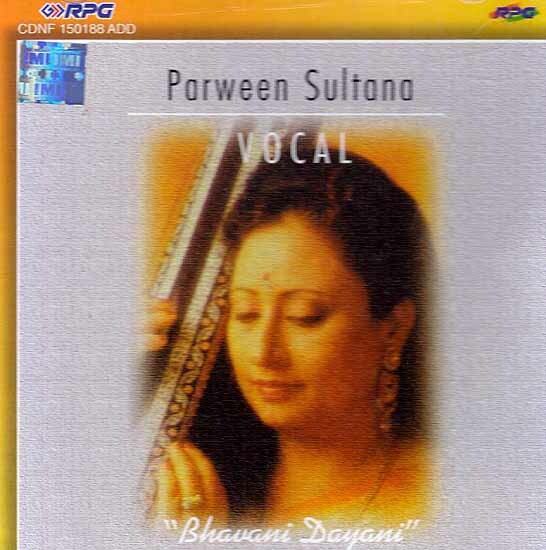 Parween Sultana’s incredible voice makes her the most stunning female virtuoso Indian music has ever known. She stormed into fame in the beginning of the seventies when she was barely in her twenties. Indian audiences were astounded at the dramatic yet nimble and extremely musical voice which flashed like lightning across three and a half octaves, a voice which could explode with power and whisper with grace. And with this virtuosity, a sparking musicality which could be intensely mellifluous, lilting and sensual. Parween Sultana was the kind of phenomenon audiences thought they would never hear again after the passing away of Ustad Bade Ghulam Ali Khan. In this album Parween Sultana has presented two ragas - Ahir Bhairav and Nandkauns, apart from her most celebrated devotional number - Bhavani Dayani. Ahir Bhairav is considered a variant of Bhairav derived by changing the upper half of the Bhairav scale to Kafi or Khamaj. Thus the raga comprises the flat second, fourth and seventh along with augmented third and sixth (komal re, shuddha ga, shuddha ma, shuddha dha and komal ni). The natural softness and pathos of Bhairav is accentuated by the komal ni. Parween Sultana treats the raga with a spontaneous sensitivity and sensuality making the portrayal one of the finest available in this raga. Nandkauns could be seen as a variant of Malkauns. While Malkauns is a five note mode comprising komal ga, shuddha ma, komal dha and komal ni (i.e. lower variants of the third, fourth, sixth and seventh), Nandkauns additionally accommodates the major third, fourth, sixth and seventh), Nandkauns additionally accommodates the major third and fifth contextually. The raga thus has a mixed colour of ominous dark power, combined with sparkle - a raga ideally suited to Parween Sultana’s quicksilver versatility. Bhavani Dayani, originally a Sadra (from the Dhrupad genre) in Bhairavi, has been trans-created into a Bhajan by Parween Sultana and has become her most identifiable song. Rarely do her fans allow her to conclude her concerts with any other number.